This tribute is for Gordon Ellwyn’s outlines a young Alberta man who sought adventure by volunteering for the Cavalry Draft RNWMP and after the war went on to become a member in several policing organizations: Saskatchewan Provincial Police, Manitoba Provincial Police and the RCMP. 2) a month later – he went on to win the British Military Boxing Championship trophy in the welter weight division. Gordon Carlyle Ellwyn was born to the parents of Clarence Andrew Ellyn (born in Thamesford -hear Ingersoll Ontario) and Mary Jane Maxwell (born in PA) on May 30, 1900 at Lethbridge North West Territories. For some unknown reason, Gordon’s father changed the original family name from Fletcher to Ellyn. 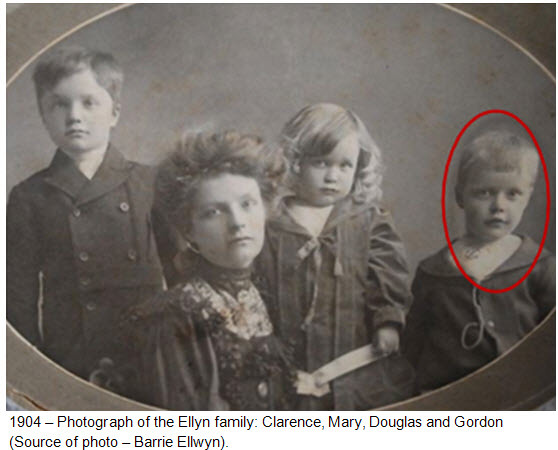 Gordon Ellwyn’s siblings were: Clarence (DOB: March 13, 1898), William ‘Douglas’ (DOB: Dec. 25, 1902) and Margret (born 1901). April 29, 1902 – Margret died at the age of 11 months at Cold Creek. The following photograph is of the remaining members of the Ellyn family. By 1906, Mary Ellyn had moved back to Lethbridge and married William Albert Ott who was 12 years her senior. William Ott was a well established and affluent businessman in Lethbridge Alberta. He had been married previously and brought five of his children into this new blended marriage. Together William and Mary had three children: Ralph, Glen and Albert. With this new family, the varied surnames of the children was confusing to many in the community. To avoid further confusion, the three girls and two original Ott boys kept the surname of OTT. The original Ellyn boys and the last 3 OTT boys (Ralph, Glen & Albert) would use the surname of Ellwyn. 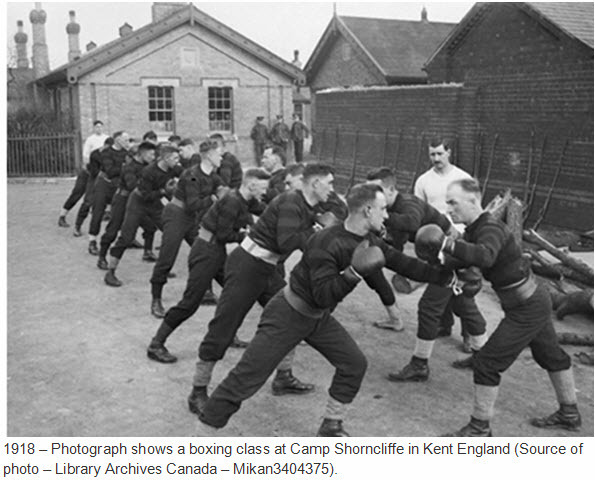 In growing up, the boys were encouraged to keep physically fit. Ralph, Glen and Gordon joined the local boxing club. With the outbreak of World War I, both Clarence Ellyn-Fletcher and Gordon Ellwyn were anxious to join the Canadian Expeditionary Forces and contribute to the fighting in Europe. Lying about his age, Clarence Ellyn-Fletcher signed up on January 21, 1915 at Calgary Alberta and was issued the Canadian Expeditionary Force #434359. After his basic training, he was shipped off to Europe and was attached to the 18th Battalion (Western Ontario Regiment). Fortunate for Clarence, he made it to the end of the war but died of pneumonia on December 2, 1918. In an effort to follow in the path set by his brother, Gordon Ellwyn also applied to join the Canadian Expeditionary Force but was rejected because he was too young. With the April 1918 advertisement for recruits for the Cavalry Draft RNWMP, Gordon applied and was instructed to obtain a preliminary medical. Based on his examination report, he was described as being fit – 5’10 ½” and 170 pounds. Upon passing the medical examination, he received funds and instructions to catch a train from Calgary to Regina. In Regina, he was met at the CPR train station and transported to the RNWMP Headquarters situated on the west side of the city. Upon arrival at the headquarters, Gordon was among 800 new recruits for this Cavalry Draft. The sudden injection of new recruits was well beyond the accommodations at the headquarters. 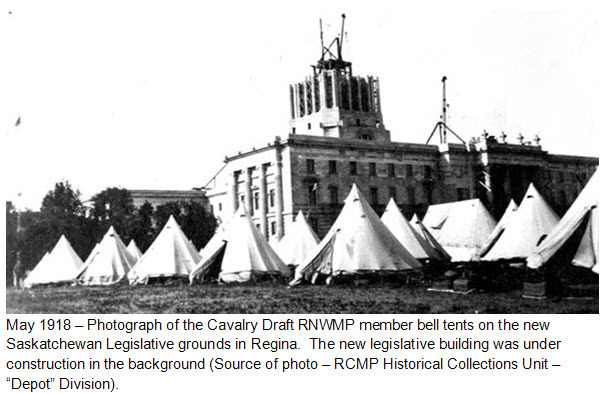 Consequently, new military bell tents were requisitioned from the District #12 Militia Stores in Regina. These tents were erected in available space at the headquarters complex and later on the new Saskatchewan Legislative grounds. 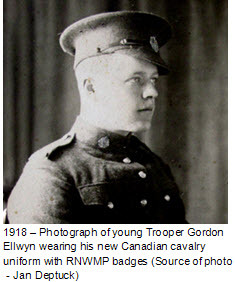 It was probably an exciting and overwhelming time for young Gordon Ellwyn living at the famous RNWMP Headquarters. Like many other new recruits, he would have reviewed the various newspaper articles posted on the walls of the Mess Hall outlining outstanding investigational achievements of past members. One of these famous members was one of his Cavalry Draft RNWMP officers – Inspector Charles LaNauze who led the Coppermine Murder investigation. 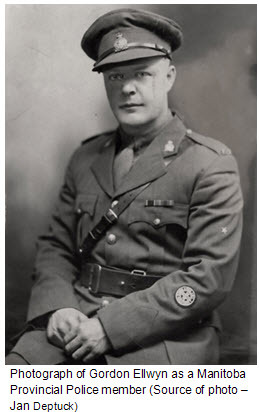 The successful candidates for the Cavalry Draft RNWMP contingent consisted of 243 RNWMP members and 495 new civilian recruits of which Gordon Ellwyn was one. All officers and NCOs of the Cavalry Draft were all RNWMP members. At the beginning of May 1918, the new civilian recruits were consumed with the completing of the necessary documentation to be sworn into the RNWMP and the Canadian Expeditionary Force. 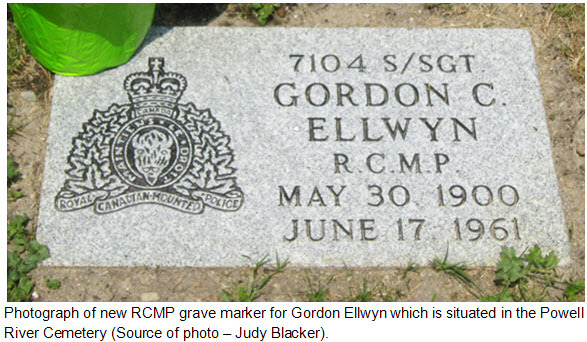 Gordon Ellwyn was assigned the Force regimental number 7104 and the Canadian Expeditionary Force number 2684208. 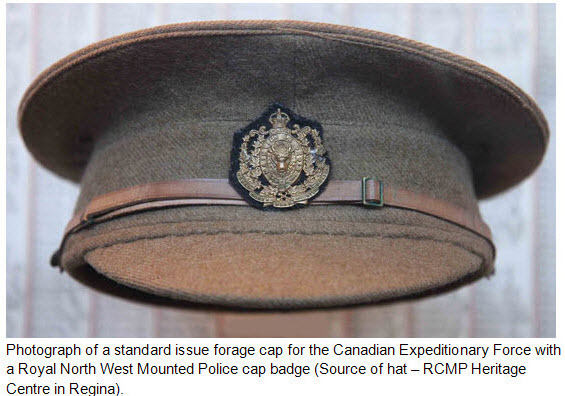 While some contingent members were being processed through the paper work of enlistment other members were receiving their Canadian cavalry uniforms with the buttons, collar dogs, shoulder titles and cap badge of the Royal North West Mounted Police. With a limited number of horses available for the new recruit training, the contingent members received basic instructions on mounting and dismounting horses in addition to foot drill. They also received classroom instruction in military law. When not receiving instructions or completing documentation, the new contingent members were kept busy with multiple fatigues such as – cleaning out the barn and kitchen duty. In Regina, members of the contingent were divided into four different squadrons: “A,” “B,” “C” and “D.” Gordon Ellwyn was a member of “B” Squadron and his Squadron Sergeant Major was Christopher Peters. 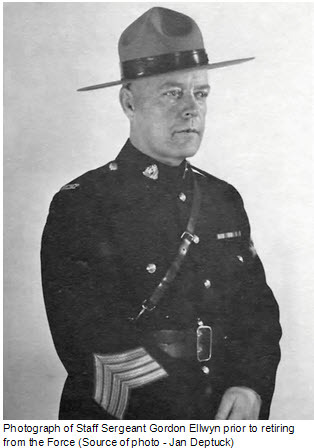 Squadron Officers were Lieutenants: Thomas Dann (in command), Stuart Wood (later to become the Commissioner of the RCMP), and Denis Ryan. 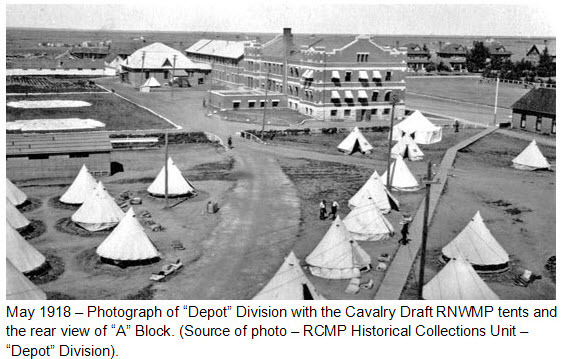 On May 30, 1918, the Cavalry Draft marched from the RNWMP base to the train station in downtown Regina. The Salvation Army band led the contingent. It wasn’t until the early morning of May 31st that two troop trains arrived to transport the contingent from Regina to Montreal. Gordon Ellwyn was on the 2nd CPR train which left at 4:30 AM. 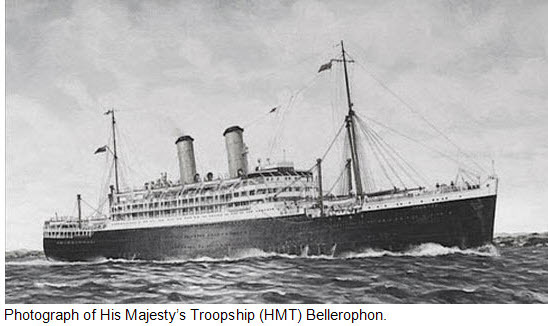 Both trains arrived in Montreal on June 3, 1918 and all were boarded onto His Majesty’s Troop Ship (MTS) Bellerophon. 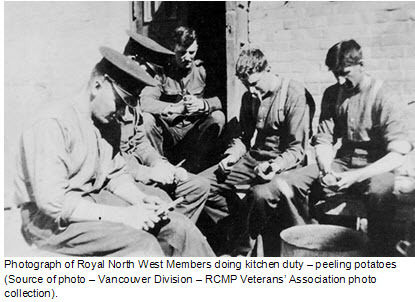 Once aboard sleeping quarters were assigned and members orientated themselves with the mess hall and washroom facilities. From Montreal, the ship cruised to Halifax to wait for the formation of the next convoy to England. On June 9, 1918, the convoy left Halifax and arrived in England on June 20, 1918. Upon disembarking the ship, the contingent was loaded onto trains and headed to their next destination – Camp Shorncliffe in Kent England. It was here that the Canadian Expeditionary Force provided training for their troops destined for the battlefields in Belgium and France. 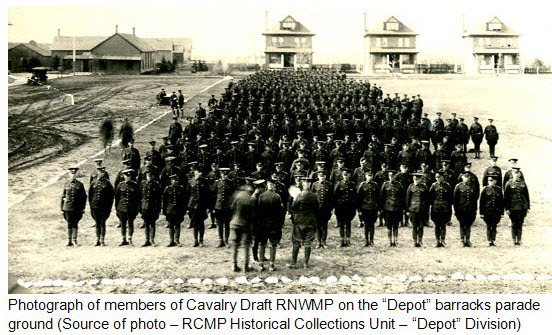 On June 24, 1918, the Cavalry Draft members were transferred to the Canadian Reserve Cavalry Regiment (CRCR). As part of this regiment, the Cavalry Draft members received instruction on many topics by various Canadian Army instructors. Since the cavalry on the western front had frequently been called on to undertake infantry action, it was necessary for cavalry training to include 16 weeks of infantry training. This chap was Trooper Gordon Ellwyn. 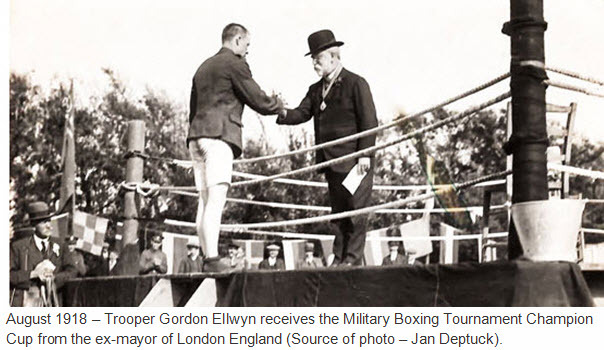 In August 1918, Trooper Ellwyn entered the British Military Boxing Championship and won the welter weight championship. 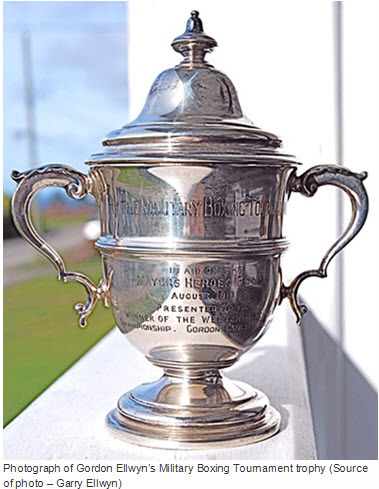 Photograph below is a photograph of the trophy which Trooper Gordon Ellwyn was awarded. 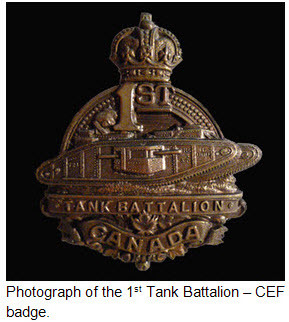 remaining members would be transferred to the 1st Canadian Tank Battalion. Only other option made available was an infantry battalion on the front line. All these members decided to accept the transfer to the 1st Canadian Tank Battalion. In October 1918, Gordon Ellwyn was transferred to the 1st Canadian Tank Battalion which was receiving their British tank training at Wool Dorset England. This battalion had completed their training and was in the process of being shipped off to the western front when the Armistice was declared. 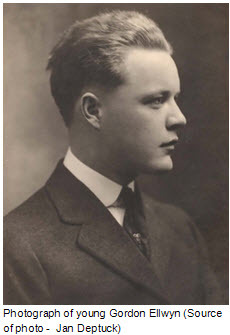 Gordon remained in England and was returned to Canada to be demobilized on May 21, 1919 then returned to Lethbridge to reconnect with his family. 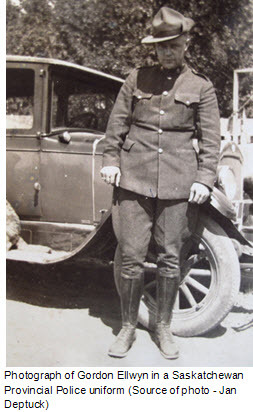 With the slump in the economy in Lethbridge in 1925, Gordon joined the Saskatchewan Provincial Police (SPP). He was assigned the regimental number 250 and received a monthly salary of $115.50. Between 1925 and June 1928, Gordon was stationed at Regina, Swift Current, Maple Creek, Gull Lake, Fox Valley, Biggar, Kerrobert and Weyburn. The majority of his duties related to criminal investigations and heavy enforcement of the liquor prohibition. The liquor enforcement was not popular amongst the Saskatchewan rural community but it was the urban communities that insisted on strict liquor enforcement. Consequently, the popularity of the SPP was diminishing especially with allegations of political interference by the provincial government. 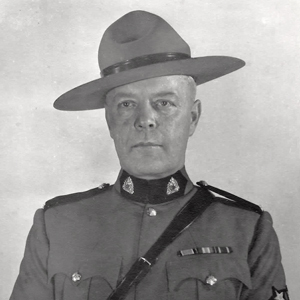 In 1927, the Saskatchewan government commenced negotiations with the RCMP to takeover the provincial policing in Saskatchewan. 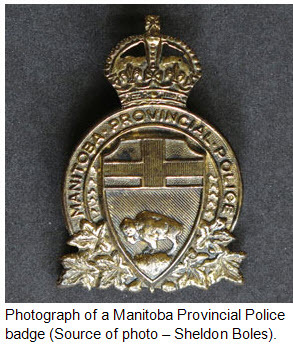 On June 1, 1928, the RCMP officially took over the provincial policing in Saskatchewan. The Force agreed to accept the SPP members into the Force provided they applied. To accommodate 53 SPP members willing to convert into the RCMP, the Force waived the marriage restrictions. Of these 53, 10 were former members of the Force. 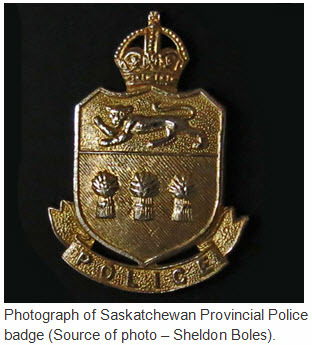 For the SPP members who didn’t wish a pay cut (from $140 per month to $68 per month) to join the RCMP, they joined either the Manitoba Provincial Police (MPP) or the Alberta Provincial Police. 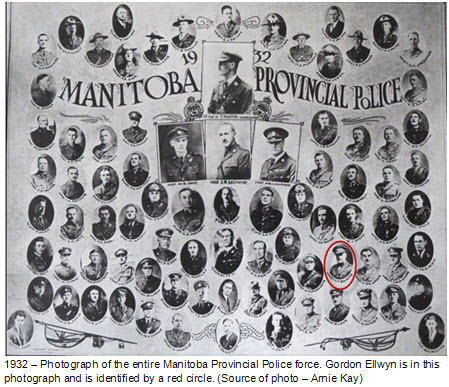 Gordon Ellwyn joined the Manitoba Provincial Police (MPP) and received a starting salary of $125.00 per month. The majority of police work for the MPP was illicit liquor trade, traffic patrol and combating gangsters robbing banks. With the financial strains being faced by many provincial governments during the Canadian Depression, the federal government negotiated to have the RCMP take over provincial policing in the provinces of Alberta, New Brunswick, Prince Edward Island, Nova Scotia and Manitoba. 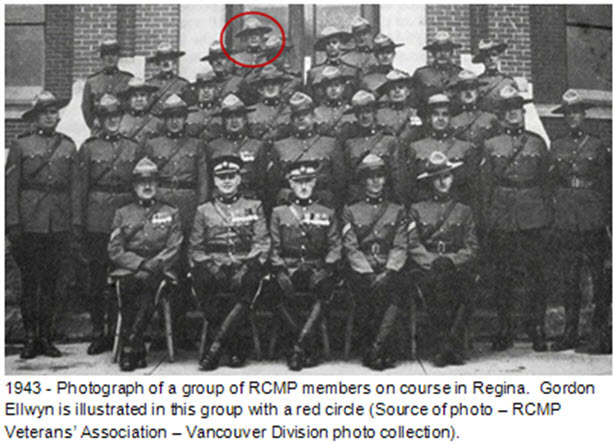 Prior to the RCMP taking over, the MPP created a single photograph containing all members of their police force in 1932. “The restriction of the Royal Canadian Mounted Police Regulations as to age limit and marriage shall not be operative to exclude any member of the Manitoba Provincial Police from admission to the Royal Canadian Mounted Police, but when once a member of the Manitoba Provincial Police has been taken on the strength of the Royal Canadian Mounted Police he will be under the provisions of the Royal Canadian Mounted Police Act and Regulations. – 11 MPP members with 1 to 2 years of service. Gordon Ellwyn was a member of the latter group. These ex-MPP members remained in Manitoba and in most cases remained at the same Detachment. With the RCMP takeover of the MPP, their new “M” Division establishment was 223 all ranks which included 7 officers and 16 civilian staff. RCMP increased the number of detachments from 37 to 58. In so doing, they created five subdivisions: Brandon, Dauphin, The Pas, Port Arthur and Winnipeg. For his entire time in the Force, he remained in Manitoba. Gordon was stationed at Shoal Lake, Selkirk and Brandon. It was at Brandon that he was the NCO ic of the Detachment and retired on March 31, 1950 at the rank of Staff Sergeant. 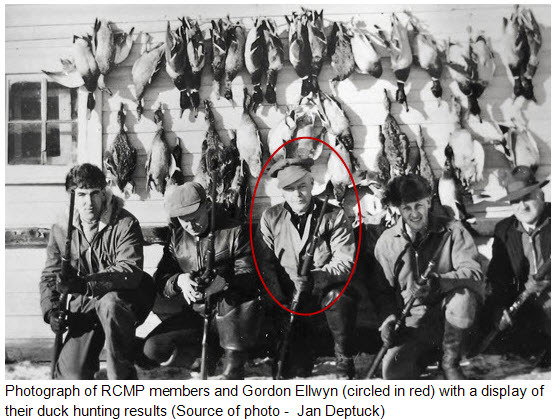 It was in Manitoba that Gordon developed an interest in duck hunting and fishing. This interest continued into retirement. 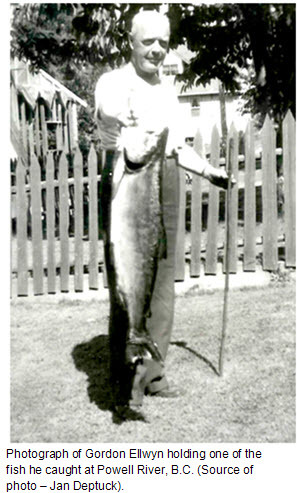 After retiring from the Force, he moved with his wife Mary Ada (McIntosh) to Deep Cove (east side of West Vancouver) where he enjoyed his favorite past time of fishing. 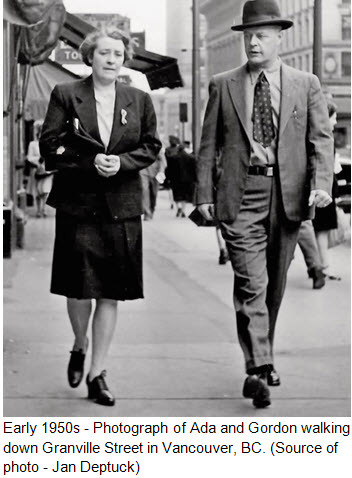 Later in 1953, they moved to Powell River and Gordon worked as a security guard at the MacMillan Bloedel Powell River Company for a few years. Gordon passed away suddenly on June 17, 1961 at Powell River, BC. He was placed to rest in the Powell River cemetery and the family arranged for the following grave marker. 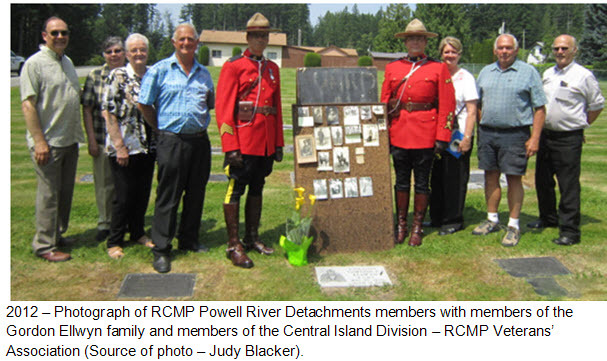 With Gordon Ellwyn being a member of the Central Vancouver Island Division of the RCMP Veterans’ Association, Veterans took it upon themselves to work with Gordon’s family to obtain a replacement RCMP regimental grave marker for Veteran Gordon Ellwyn. 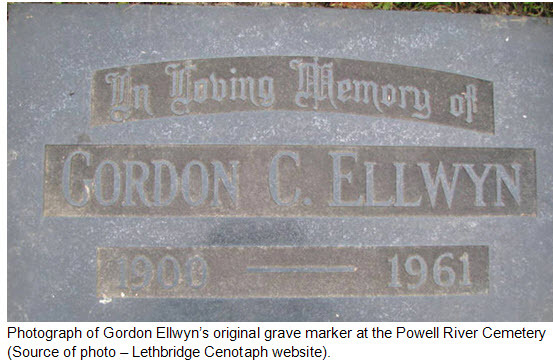 On July 9, 2012, a dedication was made at Gordon Ellwyn’s grave marker. A special thanks to RCMP Staff Sergeant Andy Brinton, RCMP Corporal Joe Holmes RCMP Veteran Terry Courte and members of the Central Vancouver Island Division – RCMP Veterans’ Association for this amazing tribute. Government of Canada: “Report of the Royal Canadian Mounted Police for the Year Ended September 30, 1932 – page 184.